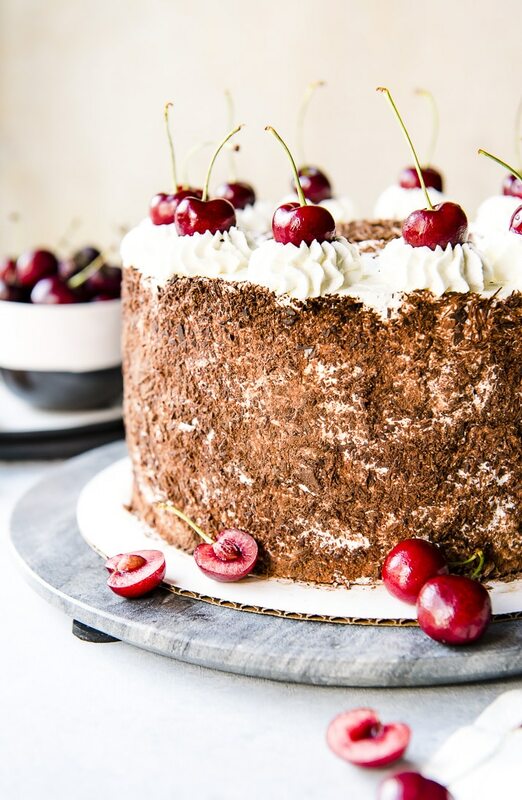 Decadent chocolate cake + boozy cherry filling + sweet whipped cream = a recipe for Black Forest Cake perfection! You’re gonna love this classic German dessert! 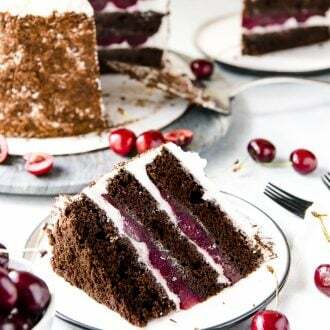 One of my all-time favorite cakes is the Black Forest Cake. Chocolate, cherries, and whipped cream are a flavor combo made in heaven! This cake is a holiday favorite in our house, but is actually a perfect summer dessert! Cherry season just happens to fall in the warmer months in North America, and the lovely ruby gems look so pretty on the finished dessert! If fresh cherries are nowhere to be found, a jar or two of tart Morello cherries will make a fantastic (and actually more traditional) substitute. Just don’t forget the kirsch! 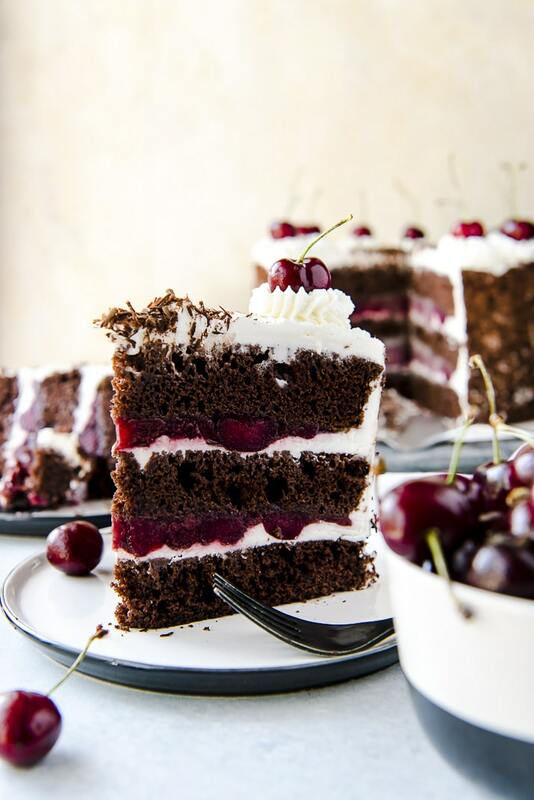 What is a Black Forest Cake? Also known as a Black Forest gateau, this cake is based on the German dessert Schwarzwälder Kirschtorte or Black Forest Cherry-torte. This cake traditionally consists of layers of chocolate sponge cake sandwiched together with whipped cream and a cherry filling. The cake is brushed with kirschwasser, a cherry liqueur for added moisture – and in Germany, the law mandates the liqueur be present for it to be a true Kirschtorte! 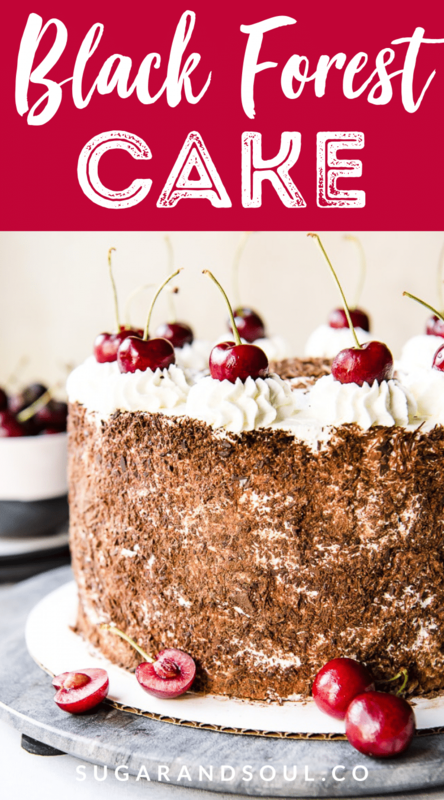 This cake is not actually named after the south-western Germany Black Forest mountain range, but after this revered spirit that is distilled from tart cherries in that area. Chocolate totally has a place on your summer menu! 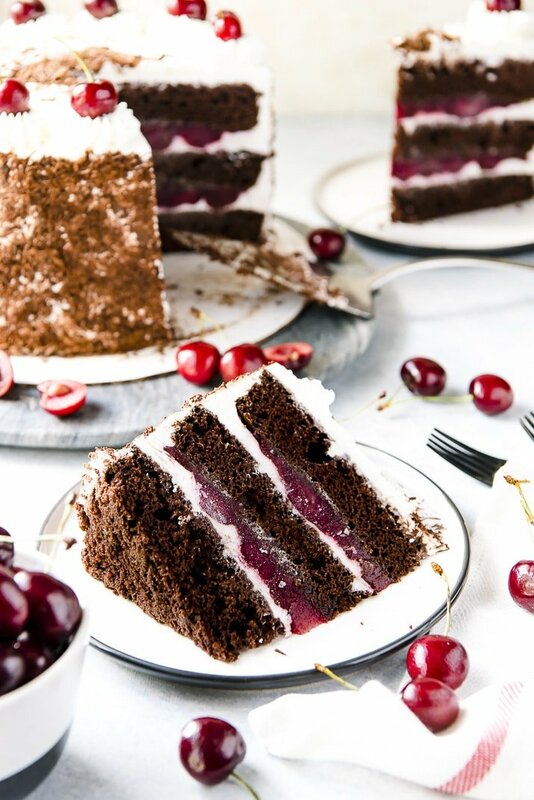 Don’t fall into the trap of thinking that chocolate cakes like this Black Forest Cake are too heavy for summer! The whipped cream keeps the light sponge cake from forming that all too familiar dessert-shaped brick in your belly after a big meal. If you’re anything like me and think dessert is required after a meal, that feeling is probably something you’ve experienced. I always say I have a second stomach for sweets, but sometimes my eyes are bigger than that stomach! Luckily, this cake is easy to devour – the tart cherries are a wonderful contrast to the rich cake. You actually might find yourself going after a second slice before the night is over! Begin by preheating your oven to 350 degrees. Whisk your dry ingredients together in one bowl, and your wet ones in another. Gradually beat the wet ingredients into the dry, then blend in eggs one at a time. Divide the batter evenly between 3 greased 8-inch cake pans. Bake the cakes for 22+ minutes until they begin to pull away from the sides of the pan. Cool them completely on wire racks while you make your cherry filling. Combine kirsch-soaked cherries, sugar, and water in a saucepan. Cook it all up for about 10 minutes until it’s thick, adding a cornstarch & water mixture to the pan to help it along. Cool it down. Whip up some heavy cream and powdered sugar into a simple whipped cream. Keep it cold until you’re ready to put the cake together. Place a layer of cake on a board or plate and brush it generously with kirsch. Spread a layer of whipped cream on it, then spread half of the cherry filling on top. Leave a 1/2-inch border on the outside, then gently press the second layer of cake on top. Repeat step 6. Brush the third and final layer with more kirsch. Crumb coat the cake with whipped cream, then chill it for at least 30 minutes. Ice the entire cake with whipped cream, then garnish the sides with grated chocolate. 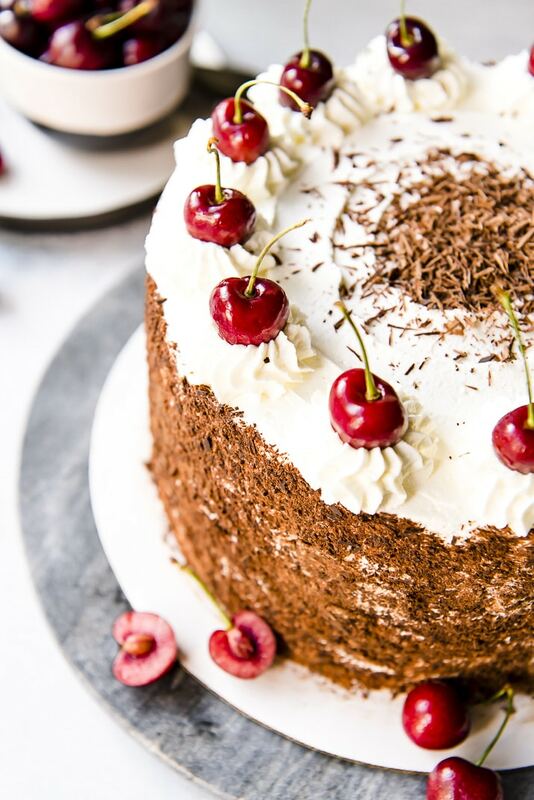 Pipe swirls of whipped cream on top of the cake and garnish with fresh cherries. Yes, you CAN make this with a cake mix! Substitute the water the box calls for with buttermilk, and add some vanilla extract and/or espresso powder to amp up the chocolate flavors. Got a can of cherry filling? Mix it with 1 teaspoon of kirsch and use it as a quick filling. No fresh cherries to be found? Drain a jar of tart cherries and soak them in kirsch for at least an hour, then proceed with the filling recipe. A store-bought tub of whipped cream is a great substitute for homemade whipped cream in a pinch. For an even faster poke cake, bake the batter in a 9×13 cake pan. Use a fork to poke holes in the warm baked cake, brush it with kirsch, then spread the cherry filling over the top, allowing it to sink into the cake. Top with whipped cream and chocolate curls. 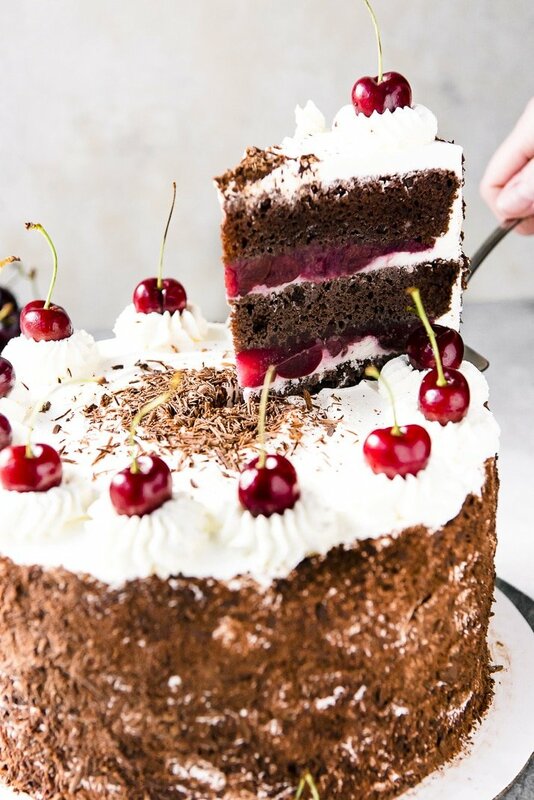 Pin this Black Forest Cake for Later! 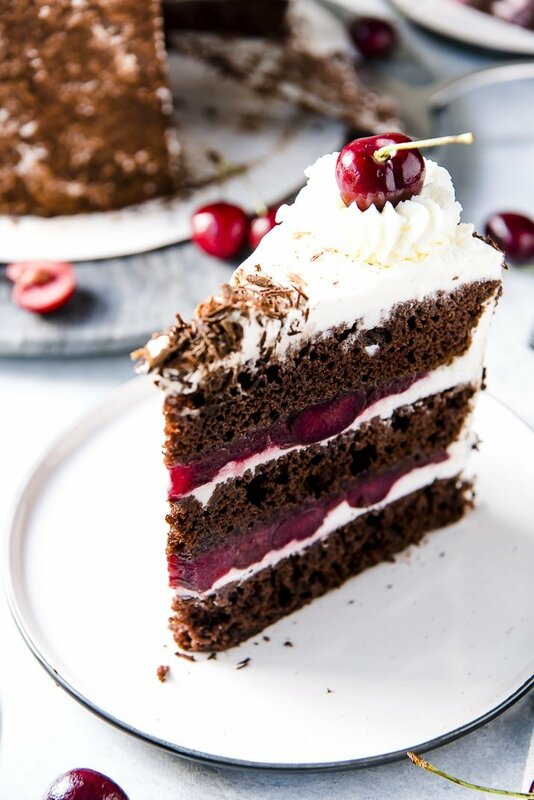 Decadent chocolate cake + boozy cherry filling + sweet whipped cream = a recipe for Black Forest Cake perfection! You're gonna love this classic German dessert! Preheat the oven to 350 degrees F. Grease three 8" round cake pans. Set aside. In a large bowl, combine the flour, sugar, cocoa, baking powder, baking soda, and salt. Whisk to combine. In a separate large bowl, whisk together the buttermilk, oil, and vanilla. Gradually beat the wet ingredients into the dry ingredients. Add the eggs one at a time, beating until well blended and smooth. Divide the batter into the prepared cake pans. Bake 22-28 minutes until a toothpick inserted in the center comes out clean. Cool the cakes in the pans for 10 minutes, then flip them onto a cooling rack and cool completely. Soak cherries 2 hours or overnight in the kirsch. Drain cherries through a fine mesh sieve, reserving the kirsch. Whisk cornstarch and 1 tablespoon of water together in a small bowl. Bring the soaked cherries, sugar, and water to a boil in a medium saucepan. Add the cornstarch & water and stir to combine. Cook 10 minutes until thickened. Remove from heat and allow to cool completely. Whip the cream until soft peaks form, then slowly add the sugar on low speed until incorporated. Whip until stiff peaks form. Trim each layer to create even layers. Place the first layer on a cake board or plate and brush reserved kirsch over the surface. Spread a thin layer of whipped cream on the cake, then top with 1/2 of the cherry filling. Repeat on the next layer. Top with the final layer of cake, brushing the top with kirsch. Crumb coat the cake with a thin layer of whipped cream, then chill it for 30 minutes. Ice the cake with the remaining whipped cream to coat the sides and top of the cake. Decorate the sides with the grated chocolate. Pipe dollops of whipped cream on top of the cake, then garnish with fresh cherries. Refrigerate the cake until ready to serve, up to a few hours. The cake will hold in the fridge for about 3 days. This cake looks so amazing! And cherries are all over the market right now! It’s definitely the perfect time to make it!